A highly valuable short story about productivity and the real value of life. A successful business man went to Chile on holidays. He had worked extremely hard all year, pulled all-nighters and accumulated lots of overtime, but finally had met his targets and pocketed his bonus. One week off in the Southern hemisphere was the least he could do to replenish his energy. Half-way through the vacation, while sipping his first Corona of the day by the beach just after lunch, toes buried in the sand and overlooking the breathtakingly beautiful bay, he noticed a small fishing boat rowing to shore. Intrigued, he walked over, helped the middle-aged fisherman pull the boat ashore and offered him a beer. The fisherman gladly accepted, and so the men sat down and started talking. “What will you do with the rest of the day?”, the businessman wanted to know. The businessman nodded, lost in thoughts. 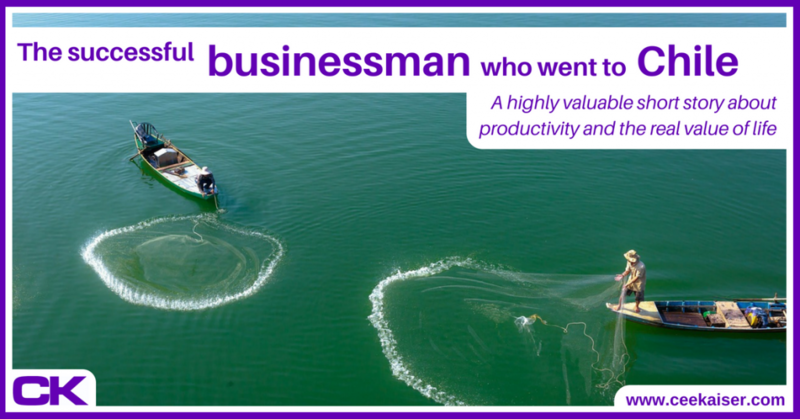 The fisherman surely had something going for him, but the businessman couldn’t stop thinking about his costly university education and the recently taken productivity courses. “Why would I do that?”, asked the fisherman, clearly not following the businessman’s train of thought. The fisherman pensively followed the businessman’s explanations, thought about it for a short while, then nodded absently. The businessman knew now was his time to seal the deal, and decided to leverage all the knowledge he had gathered about the fisherman so far to his own advantage. Triumphant he declared: “You could spend the mornings at sea fishing, then return home to play with your children in the afternoon…” He paused briefly as he understood he had been beaten. “And finally relax in the evenings singing songs and sharing stories with your best friends…” he ended with a dying voice. Moral of the story: Don’t retire early. Live now!